It’s always an extra-special treat when I can find an animated clip for the weekly Sunday Jam, because it brings the whole concept that much closer to a ‘Weekend Morning Cartoon’ vibe, which I secretly live for. You’re Welcome. Today we have an instrumental clip with the enigmatic title “Eno Nothing,” from Nashville’s Steelism — a group comprised of core-members Jeremy Fetzer (guitar) and Spencer Cullum (pedal steel player). “Eno Nothing” kicks off with our fearless duo leaving the house, embarking on an existential journey, and getting beamed aboard a drone-like craft. After stopping at an inter-galactic gas station to fuel-up, they visit many, many strange planets where they encounter such creatures as a gigantic purple tortoise, a Cthulhu and one of the benevolent aliens from Star Trek (I think). Later, they drop in on avant-garde composer and bonafide music legend Brian Eno, before ending up back where they started. Musically, “Eno Nothing” is The Toadies meets Steely Dan. Trust me on this one. It’s like Flight of The Conchords are writing the soundtrack to an imaginary sci-fi/fantasy flick! 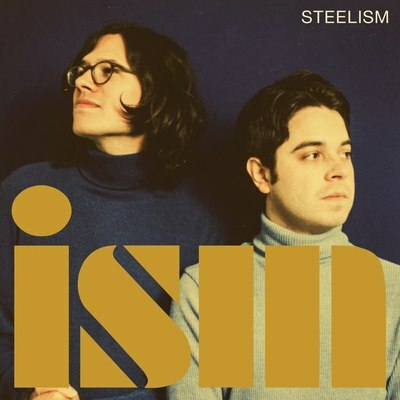 “Eno Nothing” can be found on Steelism’s sophomore album, Ism, released in June via the band’s own imprint, Intoxicating Sounds (distributed by Thirty Tigers). Ism marks the first time the band brings featured vocalists into their instrumental canon, with guest appearances from Tristen, Ruby Amanfu, Andrew Combs and Jessie Baylin. Enjoy! ← Pink Thing of The Day: Pink Fashions From Rei Kawakubo / Comme des Garçons Art of The In-Between at The Met!